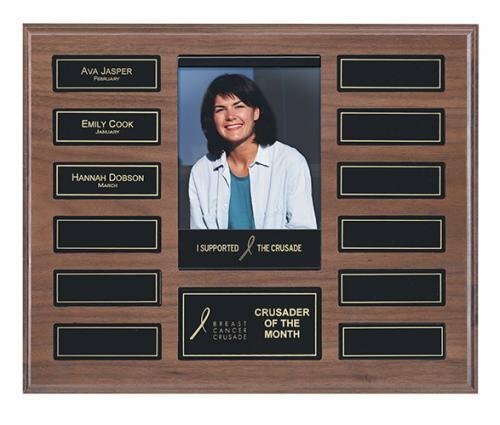 In today's world of reuse, recycle, and up cycle whenever possible to save resources, this plaque is a shining star. The plaque is made of 100% reclaimed wood so each one will have it's own unique look. The acrylic is personalized and attached by magnetic standoffs to the plaque so it appears to float and provides a 3 dimensional look. Be kind to the environment and present your high achievers a beautiful award suitable for display with any decor. Available in 3 sizes and double keyholed for vertical or horizontal hanging, it offers multiple award options. 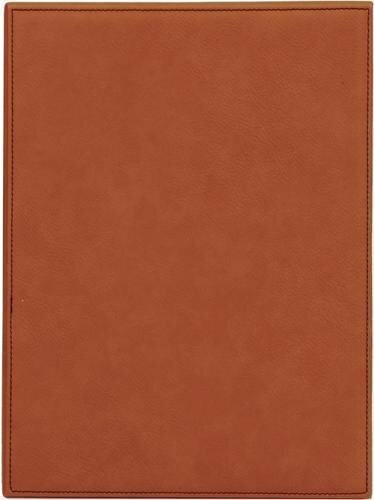 This Recognition Pocket Photo Perpetual Plaque combines easy release individual plates with hand rubbed American Walnut veneer. The magnetic release feature for plates and photo holder allow for easy replacement. This plaque holds a 4" x 6" photo. Recognition Pocket Perpetual Plaques are an inventive way to create professional awards with a magnetic release feature that allows for easy replacement of plates. 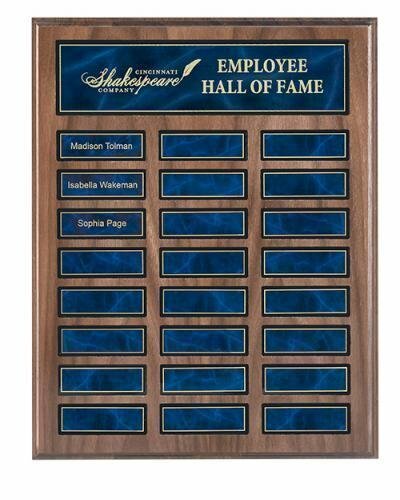 The plaque is a stunning hand rubbed American Walnut with blue gold bordered plates, and is available in 12 or 24 plates to fit your perpetual award needs. 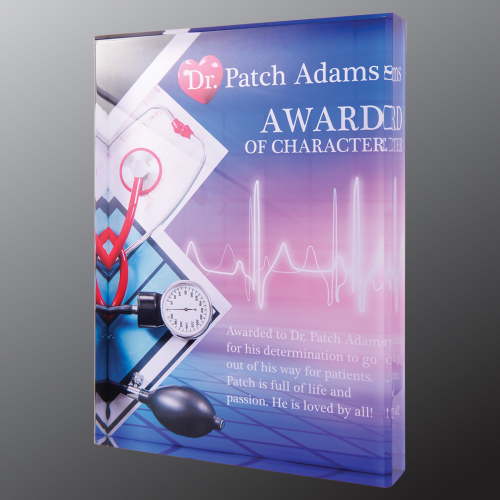 Recognition Pocket Perpetual Plaques are an inventive way to create professional awards with a magnetic release feature that allows for easy replacement of plates. 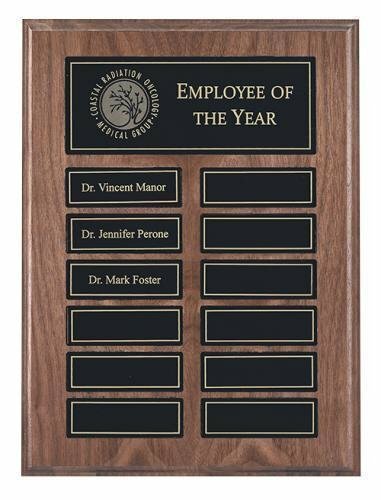 The plaque is a stunning hand rubbed American Walnut with black gold bordered plates, and is available in 12 or 24 plates to fit your perpetual award needs. 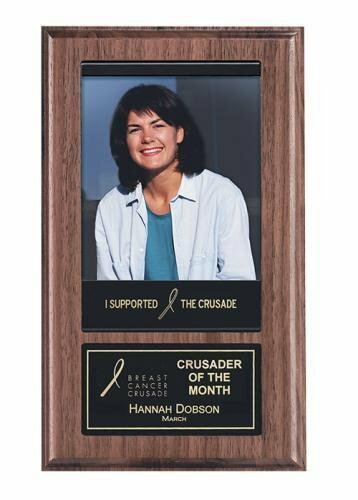 This Recognition Pocket Photo Plaque combines easy release individual plates with hand rubbed American Walnut. The magnetic release feature allows for easy replacement of plates and photo holder. This plaque holds a 4" x 6" photo.